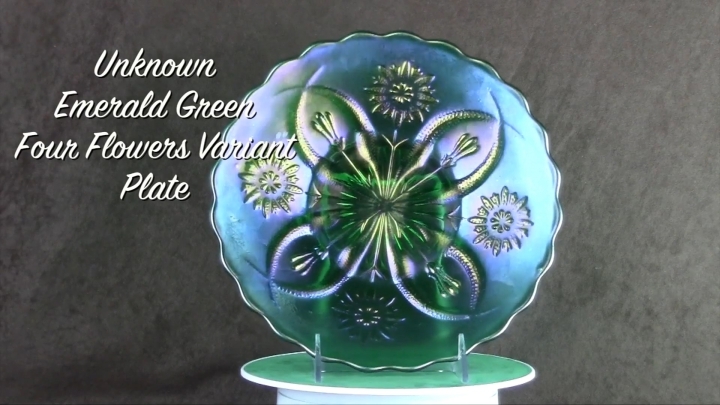 Pattern Description: Textured arcs emanating from the center form four crescents reaching the outer edge; on the standard and large sizes the crescent contains a stemmed flower bud. Four flower blossoms sit between the crescents. 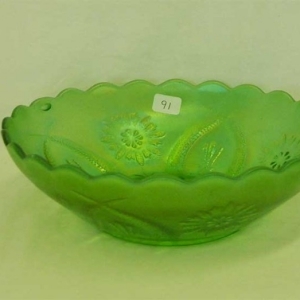 The variant differs from the Dugan version with the addition of four flower buds between the crescent shapes (except on the smaller bowls). 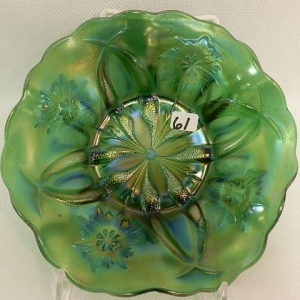 This pattern is found in bowls and plates, all with a scalloped edge. There are chop plates and standard sized plates. The back can be plain or have a thumbprint and panels design; the bases are ground. The origins have now been attributed to Brockwitz of Germany (it was assumed to be European, but wasn't validated until recently). 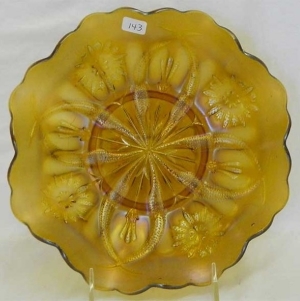 There is a smaller version of this pattern by Brockwitz (approximately 7-7 ½”) that does NOT have the four flower buds between the crescent shapes but it will come with the thumbprint back. 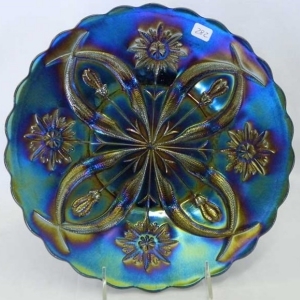 There is a version of the Four Flowers Variant that is believed to be Scandinavian – it typically has a radium finish and the crescents are much thinner and don't go as close to the edge. Dugan's Four Flowers is similar but is only found in marigold, peach opal and amethyst/purple.